The first step to planning your trip on Amtrak is to check out the company's routes: Can Amtrak take you where you want to go? Perhaps you want to make a scenic trip from New York to California. You could start out in the spring, catch a train from New York's Union station heading west to Granby, Colorado, then circle back from Sacramento east to Granby again, just in time to catch fall's colors. There's nothing more thrilling than spotting snow over the Nevada Mountains at any time of the year, and traveling coast to coast by train is not as expensive than you might think. 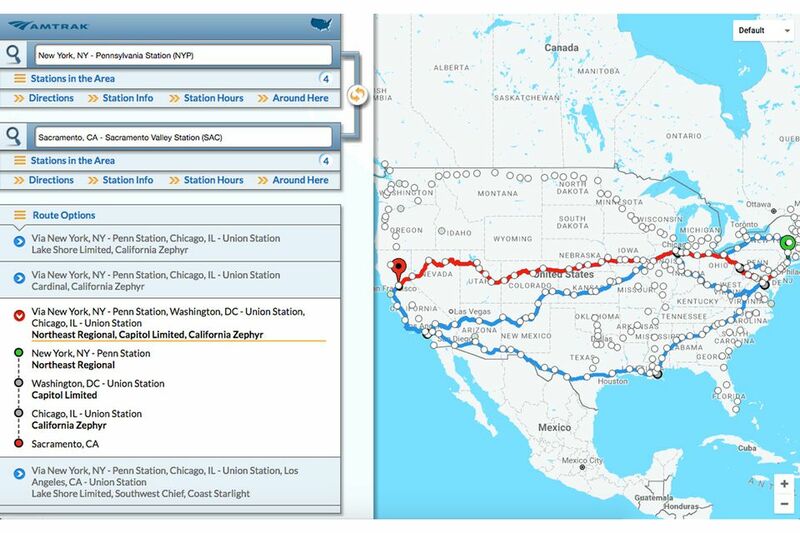 Before you set out on your own itinerary, however, find out if there's a train that makes the trip by clicking around on an Amtrak routes map, an online interactive Amtrak atlas. You can buy Amtrak tickets online, at stations, or, if all else fails, from conductors on the train itself (although these may cost more). To buy tickets online, use the company's website, and fill in the cities of choice under "Departs" and "Arrives." If purchasing tickets at the station, you can get them at the counter or from a QuikTrak kiosk. Other options include having Amtrak tickets mailed to you for a fee or ordering them over the phone. You can do this yourself or have someone else call, then pick up the Amtrak tickets at the station, provided it's staffed. There are no really big deals with long-distance Amtrak trips since unlike air travel, there are only limited number of train routes. Short hops on the East Coast, on the other hand, are a different story, and you can save here by traveling during off-peak hours, like early morning or late at night. If you're hoping to get an online bargain by shopping at the last minute, you'll probably find waiting doesn't help. If you're enterprising enough, you can figure out deals like buying an economy seat online prior to a trip, then trying to upgrade to a sleeper right on the station for a mere pittance. You can also get deals on Amtrak tickets with ISIC cards, like discounts for parents on college campus tour trips. 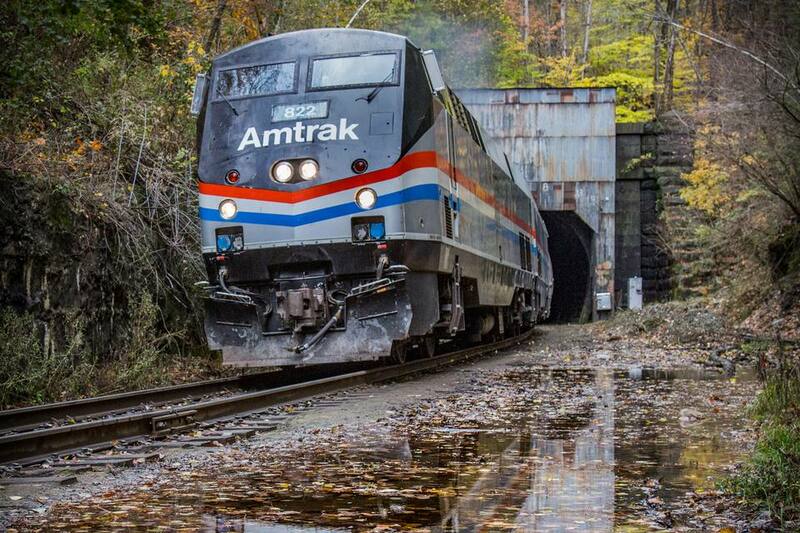 U.S. residents can now buy U.S. train passes, which was not true in the past. Amtrak passes used to be sold only to foreign visitors to encourage them to travel by train in the States, much in the same way that the best Eurail passes were saved for non-European residents. As of October 2008, Amtrak passes are available to everybody. You can choose the type of seat you want—economy coach or sleeper—when you buy your ticket. After the reservation screen pops up on Amtrak's website, click on the box that reads "Seat Options" to see prices. If two adults are traveling together, you'll find sleepers can be quite inexpensive. Amtrak Coach Seats: Regular Amtrak seats are in "coach" cars set apart from the train's dining and viewing cars. Some coach seats offer leg rests and a pillow. Most are generally two abreast and, unlike plane accommodations, they are appealingly large. You can recline with your own reading light, or if you want a little exercise, can get up and stretch your legs in other public cars. Amtrak Sleepers: Private sleeping compartments offer seats, beds, curtained doors, and some private baths. Long-haul trains generally have double-decker Superliner or one-level Viewliner cars. Single and double sleepers, or roomettes, in these cars, differ. An attendant will make up your bed in the evening and fold it away in the morning. Viewliner roomettes have an in-room toilet and sink; otherwise, roomette bathrooms are at the end of the hall or downstairs. Bedrooms, which cost a bit more, have showers. Showers are at the end of the hall in Viewliner train cars or downstairs in Superliners. Sleepers can be had on most long-haul Amtrak routes and can accommodate one to four travelers. Some offer private compartments with seats, beds, doors with curtains and, sometimes, their own baths. Amtrak Roomettes: Long-haul trains generally have double decker Superliner or one-level Viewliner cars. Pictured above is a Viewliner roomette on the Lakeshore Limited, traveling from New York to Chicago. Viewliner roomettes sleep and seat two and have a toilet and fold-down sink. Amtrak Bedrooms: Bedroom sleepers on Amtrak trains are a step up from roomettes, and have a sofa or bench-like sectional seat for two that converts to a bed, a separate seat or "easy chair," an upper bed that folds down from the wall, and a full bathroom with shower. Designed for two adults, they can also hold three; family bedrooms are larger. Amtrak Bedroom Suites: Amtrak bedroom suites, basically two bedrooms combined, are an upgrade over a bedroom and contain two bathrooms. They are designed for four adults but can hold six. Amtrak family bedrooms can accommodate six people and have no en suite bathroom facilities; these are slightly reminiscent of some European train sleepers, with bathrooms and showers at the end of the hall. The bag may not be more than 50 lbs. in weight. The bag may not exceed 28 x 22 x 14 inches in size. Excess bags cost $10.00 per item. Bags may not weigh more than 50 lbs. apiece. Bags may not exceed 36 x 36 x 36 inches in size. Skis, snowboards, and bicycles are usually checked. Checked Baggage: Big items, like snowboards, must be checked. Make sure you can check items when you buy your Amtrak ticket. Usually, you'll have to board at a station where the train stops long enough to allow loading of checked bags. According to Amtrak's website: A $5 per item handling charge applies to "special items" like snowboards and bikes. Amtrak's rules read: "Laptop computers and handheld devices may be carried onboard....Passengers may declare additional valuation up to $2,500 upon payment of the applicable charge." Just like airports, every Amtrak station is different, but finding your way is comparatively easy. Use the Amtrak website to find the station where you'll be boarding, its address, directions for getting there and an interior station map. You can also find nearby lodging, such as the popular Chelsea Hostel near Penn Station in New York. Inside the station, you may be able to find a place to store your bags (sometimes called "left luggage"). Storage costs vary and aren't included in your ticket price. At Penn Station, for instance, the service costs $4 per bag. When your train is called (anywhere from half an hour to five minutes before it actually arrives), an announcement on the PA system will tell you which at which track you can board. Sometimes the tracks are outside central sets of doors, but the area may be covered. Once outside, you'll find platforms that may be marked by letters (note the inset picture of a platform sign above). Your letter is determined by the car you'll be boarding. Coach seats and sleepers have separate cars. The word "platform" does not denote a specific raised or lowered surface—it's just one long concrete or asphalt slab at ground level. In small stations, there will be no "platforms." An attendant may offer to help with your bag and will be at the car door to direct you to your sleeper compartment or coach seat. If you're booked in a sleeper, you can take your bags directly up to your room or stash them in the luggage area just inside the lower-level doors through which you'll board the train. Once the train is fully on its way, and sometimes sooner, a conductor or assistant conductor will come by and ask to see your ticket. This is to ensure you have a valid ticket and you're in the right seat or sleeper. You may also be asked to present ID so have it ready if you're over 15. Train personnel can ask to see your ticket or ID at any time during the journey, although they usually get to know everyone's face fast and whether you're in the right car or not. Amtrak offers food in a café or dining car on most long-haul trains. Food is also available in observation cars and areas where you can buy liquor. Observation Car: The observation car's upper half is called the Sightseer Lounge and has massive windows. Tthe ones you see in the photo above are framing Colorado's Glenwood Canyon. Any passenger can sit up here and watch the scenery roll by. On some trains, volunteer rangers provide amplified narrative along the routes as part of a cooperative effort with the National Park Service. A bar or a "club car" may be part of this lounge, and you can buy drinks here and observe fellow passengers. For more socializing, the lower level is a café of sorts, selling snacks and beverages and offering tables (sometimes), a pay phone (if such a thing still exists) and movie screenings (if you're lucky). Dining Car: Hot meals are served in the dining car from a fixed menu. Sleeper passenger tickets include three meals a day, although any beverage beyond your first drink is around $1.75 extra (including water). Meals, which can range from $5-20, are also available to coach passengers. A dining car attendant walks through all cars a couple of hours prior to meals and takes reservations. You can still get a seat even if you don't have a reservation as long as there is room. Reservation times are available on the half or quarter hour. The dining car attendant will announce meal times over the train's PA system. When you arrive in the dining car, you'll be seated with up to three other passengers. Train conductors, or their assistants, on Amtrak usually are courteous, if not downright friendly. Treat them kindly, because if space is available, a conductor has the power to upgrade you to a sleeper, if you ask. You'll also meet dining car attendants. The one in charge will come through the train and take reservations for meals. While attendants can't upgrade your meals, they can make the overall dining experience more enjoyable. Sleeping car attendants pretty much stick to their stations, so you won't meet them unless you've booked a sleeper. But if you're in a sleeping car, they take care of your every need, including making your bed in the morning (and turning down the covers at night), bringing you a daily newspaper, preparing coffee and getting you off and on the train when you want to go outside and stretch your legs at station stops. Tipping Attendants: If you're in a sleeping car, the attendant can make your life more pleasant. If the attendant is helpful and courteous, consider leaving a tip. Amtrak buffs say a tip is best given in person when you disembark, although if you want to butter the staff up ahead of time, you could always try it upon boarding. Possibilities range from $5 to $20 per trip but remember: attendants are not dependent on your tips for income. This is a sign of good will, dependent on service. If you never found out who your attendant was by the time you disembark, you don't need to tip. But do give a buck per suitcase to anyone helping with bags. Tipping Dining Car Staff: Amtrak dining car attendants aren't professional waitstaff. You can tip according to whether they've made your trip more pleasant and whether the service was good. Most Amtrak insiders say a dollar per meal is average. Again, these attendants aren't dependent on your tips to make a living; you'll just be showing appreciation for especially good service. You've boarded, get ready to sit back, relax and watch the world go by. After all, isn't this what riding the rails is all about? Say you're still back on that trip to Sacramento that we started at the beginning photo guide. You watch the vista of the Green River in Utah come into view, and you know from the red rocks and blue sky looming up ahead that you're close to the mountains and valleys of home. On a plane ride, you'd fly over all of that in a flash. With a train trip, you come face-to-face. Every once in a while you need to step off the train during an Amtrak trip to stretch your legs or get a fresh breath of air outside. Sometimes these breaks are announced over the train's PA system; other times, you must do the detective work yourself by checking out train schedules and noting the names of stops ahead of time. You can get schedules on board from an attendant or, if you're in a sleeper, schedules are located behind the fold-down table. It's important to note that smoking is not permitted on trains anymore. If you're dying for a cigarette, you'll have to get off at those stations that are actually noted as "stops" on the train schedule. You're seeing a midnight view of Lincoln, Nebraska, above. That's the bosom of the American heartland, and you may find your own heart skipping a beat. Unlike the daylight breaks, nocturnal stops such as these may not be announced over the PA system, but they have an intimate charm all their own that you won't want to miss. As with the daylight stops, you can find out when and where these evenings stops take place by consulting train schedules on board. The views from Denver to Winter Park on Amtrak's California Zephyr, which we mentioned earlier, are dazzling along the Sacramento-Chicago route. The train takes its time climbing into the Rockies, and passengers can step outside to take in a deep breath of the invigorating air at Winter Park, only a couple of hours by rail from Denver. This is also the route for Colorado's famous Ski Train, which operates in winter and produces peerless vistas like the one seen above. Winter Park, by the way, is an ideal spot for a snowy spring break. There's skiing, snowshoeing, après-everything, plus more than 3,080 acres of adventurous terrain. Glenwood Springs is another of the many ravishing stops you can make on a rail trip through Colorado's Rockies.You can either get off the train and enjoy a brief respite here, or, if you have time to spend a night or two, check out the local hot springs and vapor caves, or ski in Aspen, which is just up the road. This shot was taken at the tail end of the coast-to-coast Amtrak trip we talked about earlier: New York City-Chicago-Granby, Colorado, during the spring, and Sacramento-Granby later in the fall. As you continue to make your way around the country by rail, and capture a host of pictures, you may still find that the strongest memories will always remain engraved in your heart.